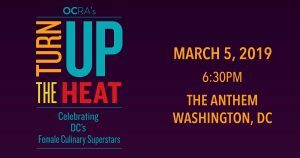 OCRA invites you to indulge in the culinary talents of DC’s top female chefs, restaurateurs and mixologists on March 5th as we Turn Up the Heat to end ovarian cancer! For one night only, you can explore the best food and drink DC has to offer, all in one place. Enjoy tastings sweet and savory, and sip unique cocktails from the region’s culinary superstars. Don’t miss it!